Tucks are common enemies appearing in Donkey Kong Country: Tropical Freeze. 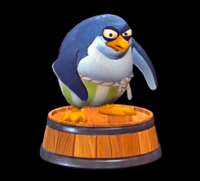 They are pudgy and hunched penguin-like members of the Snowmads and are also among the most common and easy to defeat species in the game. They wear green striped trousers tightened around their waists with a knotted rope. Their name likely comes from 'tuxedo', which penguins are often said to be wearing in reference to the pattern of their black and white feathers. Tucks walk slowly from side to side, and if touched from the sides, they will slap the Kongs and cause them to lose one heart from their health counter. However, Tucks are vulnerable to absolutely any attack, such as a stomp on their broad hunches, a roll move, or a projectile tossed at them. Due to their primitive method of defense, Tucks can be compared to Kritters, Klomps, Kobbles, and Tiki Goons from the previous installments of the Donkey Kong Country games. Pengā Pengar; derived from "penguin" 「ペンギン」 pengin and "víkingar" from Old Norse. Spanish Vilgüino Raso Portmanteau of vil (vile) and pingüino (penguin). Raso (private) indicates its rank. French Gorfufu From Gorfu a penguin specie with the repetition of "fu" which is spelled like "fou" (crazy) and thus spells "foufou" which means nutty. This page was last edited on February 14, 2019, at 20:03.